Join us at 6.30pm on 16th February for the launch of Battling the Gods: Atheism in the Ancient World by Tim Whitmarsh. 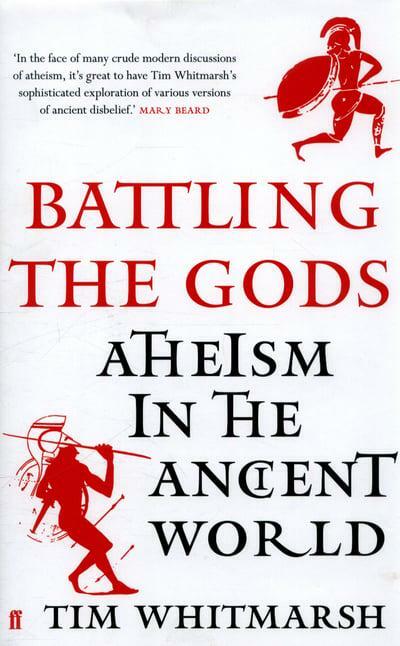 Long before the European Enlightenment and the Darwinian revolution, which we often take to mark the birth of the modern revolt against religious explanations of the world, brave people doubted the power of the gods. Religion provoked scepticism in ancient Greece, and heretics argued that history must be understood as a result of human action rather than divine intervention. They devised theories of the cosmos based on matter, and notions of matter based on atoms. They developed mathematical tools that could be applied to the world around them, and tried to understand that world in material terms. Their scepticism left a rich legacy of literature, philosophy and science, and was defended by great writers like Epicurus, Lucretius, Cicero and Lucian. Tim Whitmarsh tells the story of the tension between orthodoxy and heresy with great panache, a story that ended – for the moment – with the imposition of Christianity on the Roman Empire in 313 CE. Join us on 25th April for the launch of Democracy: A Life by Professor Paul Cartledge. Democracy is either aspired to as a goal or cherished as a birthright by billions of people throughout the world today – and has been for over a century. But what does it mean? And how has its meaning changed since it was first coined in ancient Greece? Democracy: A Life is a biography of the concept, looking at its many different manifestations and showing how it has changed over its long life, from ancient times right through to the present. Democracy: A Life will be available to purchase at the event at a special discounted price.